Who is Harmony on the Sound? 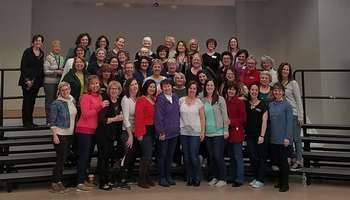 We are Harmony on the Sound Chorus, a chapter of Sweet Adelines International. We sing 4-part, a cappella harmony in the Barbershop style. We are a new kind of barbershop! We sing all kinds of music from pop to rock and roll to country. Just take exit 47 off the Merritt Parkway. Want Harmony on the Sound to sing at your next function? Why not hire Harmony on the Sound to entertain at your next event? We can perform at corporate functions, charity events, community Entertainment events, birthday parties, christmas parties, awards nights, weddings, engagements, anniversaries, and even funerals and memorial services.